When Dave Loeks drove his Ford van to Whitehorse in 1982, the Yukon was mining country. The Klondike Gold Rush was still the stuff of lore. Workers at the Faro zinc mine still pumped toxic tailings into an open pit. Indigenous residents were still mostly segregated from the settler community. That’s changing, Loeks says, and rapidly. Indeed, to Loeks and many others, the Yukon is the vanguard of a growing Indigenous land power movement in Canada centred mostly in the North. 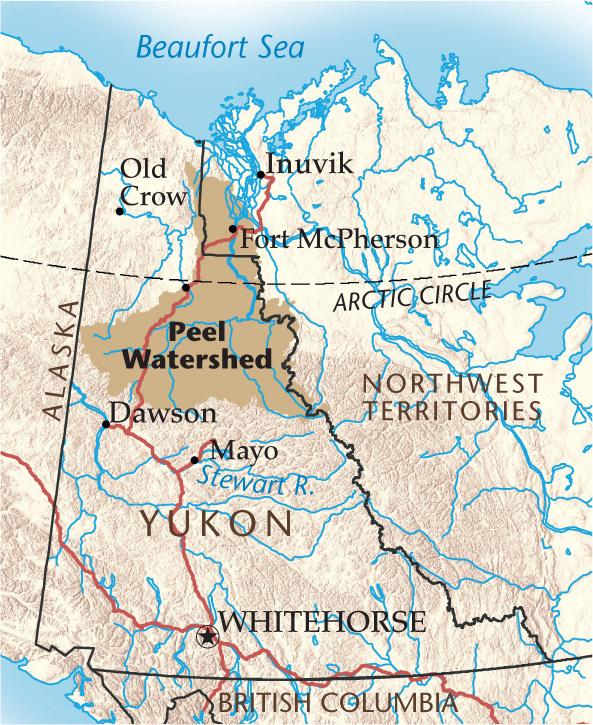 Earlier this month, the Supreme Court of Canada ruled in favour of several Yukon First Nations, who sued the territorial government for failing to respect their land-use wishes for the Peel River watershed. The victory resets the territory’s planning for the Peel and also rebukes the colonial, money-first approach to land management that Loeks says dominated 35 years ago. What lies ahead for the Peel now will be closer to what First Nations imagined seven years ago, when planning began. In 2011, Loeks headed the independent Peel Land Use Planning Commission, whose work was suggested by the Umbrella Final Agreement (UFA), a modern-day treaty that The Council of Yukon Indians signed with Canada and the Yukon in 1993 and which kick-started land claims in the territory. The UFA is complex, but a simple explanation is that it guides First Nations and Canada toward final agreements that release aboriginal claims to traditional lands in exchange for defined land ownership and self-government rights. All told, First Nations now control about nine per cent of the Yukon’s land. The Peel River watershed was the first test for whether the idea of co-management would work in practice. Loeks and the commission gathered feedback on whether and how the 68,000 square kilometres of wilderness that lie within the Yukon (the watershed also extends into the Northwest Territories) should be developed. Loeks says it was clear that the majority of respondents — Indigenous and non-Indigenous alike — placed a higher value on the area’s pristine water and unbroken wildlife habitat than on its buried ore and oil. In 2011, the commission released its recommendation: that 80 per cent of the Peel be protected and 20 per cent be opened to mining development. No one lives in the Yukon portion of the Peel watershed. There are almost no roads or trails. It’s one of the last undeveloped wilderness regions in Canada and the world. But mining companies see dollars underneath the beauty. But then, things got interesting. No one lives in the Yukon portion of the Peel watershed. There are almost no roads or trails. Human visitors number only in the hundreds per year. It’s one of the last undeveloped wilderness regions in Canada and the world. But mining companies see dollars underneath the beauty. More than 8,000 claims were staked while the commission was reviewing the watershed’s future. That’s unsurprising, given there are an estimated five billion tonnes of iron ore, 400 million tonnes of coal and 20 million barrels of oil lurking there. That potential mining bonanza — and worries that blocking development would “bankrupt” the territory with lawsuits by mining companies — inspired the governing Yukon Party to ignore the commission’s recommendation. In 2012, it released its own vision for the Peel’s future: mining would be allowed in 71 per cent of the region and just 29 per cent would be protected. In response, “Everybody went nuts,” Loeks says. The Yukon Party, long the party of industry in the Yukon (and long dismissive of Indigenous rights), plummeted in popularity; it was eventually voted out of power in 2016. In the meantime, Yukon First Nations took matters into their own hands. In 2014, the Nacho Nayuk Dun and Tr’ondek Hwech’in nations joined forces with the Canadian Parks and Wilderness Society and the Yukon Conservation Society and sued the government. Their lawyer was none other than Thomas Berger, whose work in the 1970s on resource development in the North helped create the modern treaties that now govern the Yukon, as well as the Northwest Territories and Nunavut. Berger maintained that the territorial government’s proposal was unilateral and violated the UFA. Canada’s highest court agrees. Many First Nations chiefs in the Yukon insist there is no inherent conflict between mining interests and Indigenous land claims — as long as the process spelled out in the UFA is followed. And with $120 million in mineral exploration in 2017, mining companies are not about to abandon the territory. But Loeks says the mining industry must take pains to earn the public’s trust. Yukoners don’t want another disaster like the Faro mine, which has been closed for two decades and will take another decade at least to reclaim at a cost of half a billion dollars. Tim Querengesser is a writer based in Edmonton. He holds a masters degree in Canadian Studies and Indigenous Studies and has worked as a reporter in the Yukon and Northwest Territories.